Lieutenant General Valery Asapov, killed near Deir al-Zor (World War News, September 24, 2017). A Syrian army armored force crosses the Euphrates from the west bank to the east on the floating bridge built by the Russians (Syria-Victory, September 24, 2017). Iraqi Prime Minister Haider al-'Abadi updated by Iraq's security heads about military preparations for attacking al-Hawija (Nineveh Information Center, September 24, 2017). Iraqi forces in the area of al-Zab (al-A'an channel, September 25, 2017). 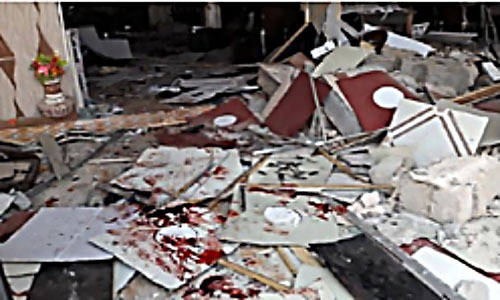 The scene of the suicide bombing attack in the restaurant in Baiji (aliraq.net, September 19, 2017). The Islamic State is disintegrating in Syria and Iraq. Its territorial areas of control Iraq are falling to the two anti-ISIS coalition forces one after another, although in some important strongholds ISIS operatives continue stubborn fighting. 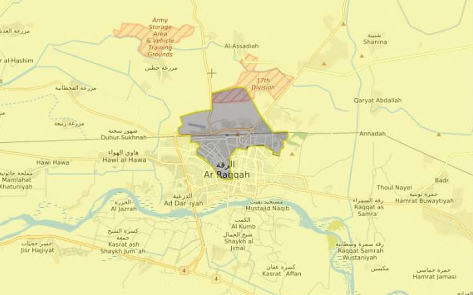 In Syria the Syrian Democratic Forces (SDF) forces now control most of the city of al-Raqqa, “ISIS’s capital.” ISIS operatives continue fighting from the limited area under their control in the center of the city. In Deir al-Zor Syrian forces took control of the region west of the Euphrates. They have enlarged the areas of their control in the Deir al-Zor region and established themselves to the east of the Euphrates (leading to violent friction with the American-sponsored SDF forces). In Iraq the Iraqi forces have begun operations to occupy and clean out the remaining ISIS enclaves in the northern and western parts of the country. This past week they initiated an attack on an ISIS enclave in the region of al-Hawija, south of Mosul. The Iraqis have reported achievements. At the meantime, the Iraqi forces began an operation to take control of the western part of (the Sunni) al-Anbar Province, along the Euphrates. The Iraqis reported having taken the district of ‘Anah and that they were currently advancing towards the ISIS stronghold in al-Qa’im, near the Iraqi-Syrian border. Deep Russian involvement is evident in the campaign for Deir al-Zor. For example, Russian military specialists constructed a pontoon bridge over the Euphrates to allow the passage to the eastern bank of Syrian army forces and armored vehicles. However, Russian presence has cost Russian lives. This past week Lieutenant General Valery Asapov and several of his aides were killed by ISIS mortar fire at a Syrian headquarters in the Deir al-Zor region. He was apparently the highest-ranking Russian army officer killed in Syria so far. To reduce the level of friction around Deir al-Zor, especially on the eastern bank of the Euphrates, this past week senior Russian and American military personnel met and discussed ways to increase bilateral coordination. Operatives of the Headquarters for the Liberation of al-Sham (an umbrella organization affiliated with al-Qaeda) surrounded Russian military police supervising the new de-escalation zone in Idlib. The Russian military police were rescued by an assault force of Russian Special Forces and Russian aerial support. The clash illustrated the potential for friction in the new de-escalation zone in which the Headquarters the of Liberation of al-Sham is the dominant military force. In ITIC assessment, the Headquarters of the Liberation of al-Sham has no intention of allowing de-escalation to be realized on the ground. The Syrian army succeeded in taking control of 87.4% of the territory controlled by ISIS in Syria. About 2,234 populated regions have joined ceasefire agreements (i.e., agreements of de-escalation) since February 2016. The Russian air force carried out more than 30,000 sorties and destroyed more than 96,000 “terrorist targets.” That included the destruction of 8,332 command posts, about 1,000 training camps and 6,769 oil and ammunition storehouses. The attacks killed 53,707 terrorist organization fighters. ISIS’s petroleum infrastructure was heavily damaged. Destroyed were 212 oil fields and 184 workshops and refineries. The campaign for Deir al-Zor has created friction between the Russians and Syria forces on the one hand and the United States and the SDF forces on the other. That is because the forces operate in close terrain compartments (the Syrian forces operate mainly on the western bank of the Euphrates and the SDF on the eastern bank). The effort of the Syrian force to establish itself on the eastern bank (see below, Syria) increased the potential for friction. For that reason Igor Konashenkov, spokesman for the Russian ministry of defense, said that the Russian force had recently been fired at twice from the direction of the SDF forces. He warned that any SDF attempt to open fire would be met with a Russian response (CNN, September 21, 2017; Deutsche Welle, September 22, 2017). The Russians claim to have aerial photographs from September 8-12, 2017, documenting the location of ISIS operatives in Deir al-Zor Province. A large number of Hummers appear in the photographs, which are used by the American Special Forces. They were seen in strongholds which formerly belonged to ISIS (Facebook page of the Russian ministry of defense, September 24, 2017). The Russian ministry of defense reported the death of Lieutenant General Valery Asapov, killed near Deir al-Zor by ISIS mortar fire. 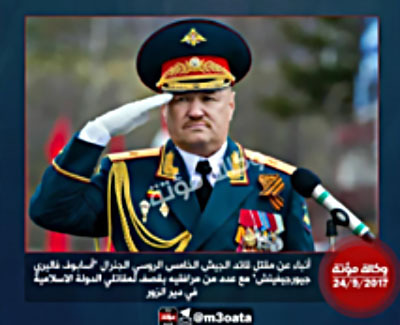 He was commander of an army in the Russian Army and was stationed in Syria with a group of Russian military advisors supporting the Syrian commanders in the campaign for the liberation of Deir al-Zor. Before going to Syria he served on the front in the Ukraine. Asapov is expected to receive a posthumous medal (Sputnik, September 24, 2017). He was apparently the highest-ranking Russian officer killed in Syria so far. On September 19, 2017, operatives of the Headquarters of Fateh al-Sham Front, an umbrella organization affiliated with al-Qaeda, surrounded 29 Russian military policemen with the intention of abducting them. The policemen were carrying out a surveillance mission as part of the province of Idlib with the new de-escalation zone. For a number of hours the Russian forces, with support from local Syrian forces, tried unsuccessfully to rescue the military police. In response, a team was organized to extract them. It was composed of Russian Special Forces, officers from the Northern Caucasus and Syrian army soldiers. During the fighting three Russian Special Forces fighters were wounded (website of the Russian ministry of defense, September 20, 2017). The operation was accompanied by aerial attacks, and ended with the rescue of the Russian military policemen. In addition, the Veliky Novgorod, a Russian submarine stationed in the Mediterranean Sea, fired a number of Kalibr cruise missiles at the Headquarters of the Fateh al-Sham Front forces near Idlib. According to a Russian report, command and control posts were destroyed in the attack, as were training bases and armored vehicles involved in the attempted abduction (Facebook page of the Russian ministry of defense, September 22, 2017). The clash clearly illustrates the potential for friction between the Russia military and the Syrian forces on one hand and the Headquarters of the Fateh al-Sham Front on the other regarding the agreement for de-escalation around Idlib. The Headquarters of the Fateh al-Sham Front is the dominant force around Idlib, and implementing the agreement on the ground can be expected to face violent resistance, directed at the Syrian forces and their allies (Russia and Turkey). The fighting in al-Raqqa continues. Apparently SDF forces currently control most of the neighborhoods (about 80%). ISIS operatives have retreated from the center of the city and are mostly engaged in a sniper war. According to Talal Salo, official SDF forces’ spokesman, al-Raqqa will be fully liberated within a week or two. He said the forces now have to take control of the remaining 20% of the city, including the al-Saa’h and al-Na’im Squares located in the so-called “security square” – a focal point of ISIS control and activity in the center of the city (al-Durar al-Shamiya, Dimasq-A’an, September 23, 2017). ISIS’s so-called “security square” in the center of al-Raqqa (Orient News, September 1, 2017). 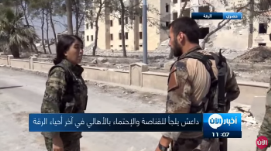 SDF forces in one of the al-Raqqa neighborhoods taken control of (al-A’an channel, September 23 2017). On September 24, 2017, a video was published on Twitter documenting a clash between SDF forces and ISIS in al-Raqqa. The video begins with SDF forces advancing to the battle ground, passing through the devastated streets of al-Raqqa (exact location not noted). They went through the broken walls of buildings, probably to avoid sniper fire (Furat F.M YouTube account, September 24, 2017). ISIS operatives fight with determination, causing many losses among the SDF forces. ISIS operatives often fire anti-tank missiles and employ sniper fire. The Syrian forces continue to establish themselves on the western bank of the Euphrates and to take control of additional areas in the region of Deir al-Zor. On September 25, 2017, the Syrian army reported that its forces had taken control of the entire area to the west of Deir al-Zor (Syrian TV, September 25, 2017). According to Igor Konashenkov, spokesman for the Russian ministry of defense, more than 85% of Deir al-Zor is now under Syrian army control, and in his assessment the city will soon be liberated. Konashenkov added that the Russian Special Forces support the Syrian army soldiers against ISIS (TASS, September 21, 2017). In the meantime, the Syrian forces, with Russian support, are establishing themselves on the eastern bank of the Euphrates, with local clashes between them and the American-sponsored SDF forces, which operate in the same area. During the past week Syrian army forces took control of a number of villages on the eastern bank of the Euphrates, among them the village of Mazlum and the town of Khashem (see map, above) (Syria-Victory, September 24, 2017). That created the potential for friction with the SDF operating in the same area. ISIS reported that on September 23, 2017, its fighters attacked the village of Mazlum, killing seven Syrian soldiers and wounding three (al-Sawarim, September 24, 2017). To make it possible for Syrian army tanks and armored vehicles to cross to the eastern bank of the Euphrates, the Russians built a pontoon bridge. 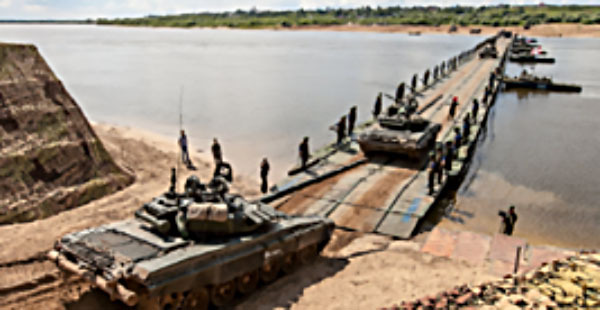 Vladimir Burovtsev, head of road service at the Russian ministry of defense, said Russian military road specialists had constructed a pontoon bridge over the Euphrates for the passage of vehicles, only a few kilometers from Deir al-Zor. The bridge, according to the Russians, was built under fire in two days, and enables the passage of heavy armored vehicles (TASS, September 26, 2017). On the other hand, SDF forces took control of the Conoco gas field to the east of the Euphrates and of the adjacent factory (al-Durar al-Shamiya, September 22, 2017; Syria.net, September 24, 2017). It is the largest gas field in Syria, until now controlled by ISIS. They also took control of the nearby al-‘Izbah gas field (Syrian Observatory for Human Rights, September 23, 2017). In addition, international coalition forces landed forces in the near the Conoco oil field, during which a prominent ISIS commander aka Hamam Turki al-Ramadan was detained (Khutwa, September 20, 2017). In an attempt to prevent friction between the various forces operating in the same terrain compartment (east of the Euphrates), American-Russian contacts were held on the ground. Colonel Ryan Dillon, spokesman for the Combined Joint Task Force, said high-ranking American and Russian army officers had met near Deir al-Zor to prevent clashes between their forces. He said they discussed increased coordination and ways to prevent crises, such as intelligence collaboration. He also said more meetings would be held (Reuters, September 21, 2017). Despite the strong pressures exerted on ISIS, it continues its military resistance. Its most prominent achievement was the killing of Lieutenant General Valery Asapov. According to reports, he and some of his aides were killed by ISIS mortar shell fire which hit a Syrian headquarters post he was visiting. On September 23, 2017, several dozen Syrian army soldiers were killed and many more wounded in an ISIS attack on Hawijat Sakr, an island near Deir al-Zor. A suicide bomber also participated in the attack, blowing up a car bomb. Three Russian soldiers were among those killed (Syrian Observatory for Human Rights, September 24, 2017). 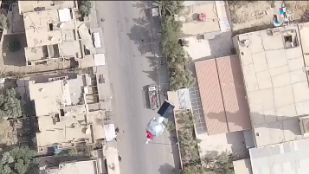 A bomb dropped from an armed ISIS drone. Its target is a truck used by the Syrian army’s information team in Deir al-Zor (al-Sawarim, September 21, 2017). Syrian TV reported that in view of the heavy pressures exerted on ISIS, the organization had evacuated most of its foreign operatives and their families from Deir al-Zor to eastern rural areas (Twitter account of Syrian TV ORTAS Videos, September 20, 2017). A local source in Deir al-Zor reported that ISIS had appointed Ahmed Daham, formerly a commander in the Free Syrian Army, as overall commander (“emir”) of the Deir al-Zor Province (i.e., Deir al-Zor Province) (All4Syria, September 24, 2017). On September 24, 2017, the Syrian army published a video allegedly showing armed UAVs from the Iranian Islamic Revolutionary Guards Corps’ UAV unit, using missiles to attack ISIS headquarters and vehicles in the Syrian desert (near the Syria-Iraq border). The video showed ISIS targets (two headquarters, an armored vehicle and a gas station) photographed with two cameras: one mounted on a surveillance drone and the other on a missile launched from an armed UAV (Twitter account of the institute for combat information of the Syrian army, September 24, 2017). On the morning of September 21, 2017, Iraqi Prime Minister Haider al-‘Abadi announced the beginning of a campaign to occupy the ISIS enclave in al-Hawija (al-Arabi al-Hadath, September 21, 2017). The city of al-Hawija lies south of Mosul, between Kirkuk and the Euphrates. Since it was taken over by ISIS at the beginning of 2014, the city and its surroundings have served ISIS’s operatives as a base from which to attack Baiji, Tikrit and Kirkuk. In July 2016, during the campaign for Mosul, the region of al-Hawija was isolated from the other regions controlled by ISIS and the ground was prepared for occupying it. When the beginning of the operation was announced, it was reported that the Iraqi security forces had taken control of the western part of the city. At the same time, as part of the campaign to liberate al-Hawija, the Iraqi government’s counterterrorism apparatus initiated an operation to liberate al-Zawiya and al-Namal, both west of the Tigris about 40 kilometers west of al-Hawija (al-Sumaria, September 23, 2017). Reportedly, the campaign was waged with relative ease because of the small number of ISIS operatives deployed in the area (al-Rafidayn channel, September 24, 2017). 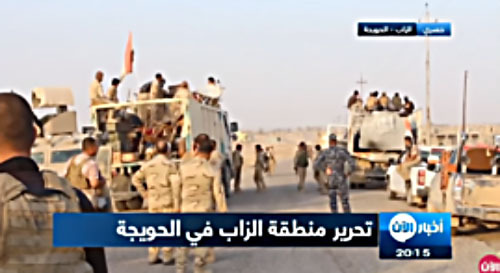 The Iraqi army also took control of the region of al-Zab, about 25 kilometers west of al-Hawija, which was also under ISIS control. In the meantime, with coalition air support, Iraqi security forces began an operation to increase their control over the western part of al-Anbar Province. The goal was to occupy the cities of ‘Anah, Rawa and al-Qa’im, and drive ISIS out of the desert region on the Iraq-Syria border. The region of ‘Anah was liberated. Iraqi security forces continued towards Ra’wa and al-Qa’im. 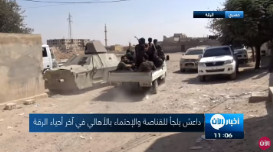 The campaign for al-Qa’im is expected to be difficult because the city is an important stronghold for ISIS. So far dozens of ISIS operatives have been killed and dozens more detained (al-Ghad channel, September 23, 2017; al-Falluja channel, September 19, 2017). According to Iraqi army sources, in the aerial attack carried out by the Iraqi air force on September 19, 2017 against ISIS in al-Qa’im, 49 ISIS operatives were killed, among them Abu Bakr al-Baghdadi’s deputy (al-A’an channel, September 19, 2017). Right: Iraqi army forces in western al-Anbar Province (al-Falluja channel, September 19, 2017). Left: Iraqi security forces in ‘Anah after the liberation (al-Hura, September 23, 2017). 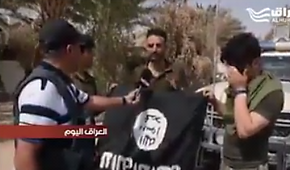 An Iraqi soldier wipes out the slogan reading, “the Islamic State stands firm and is spreading,” written on a wall in ‘Anah (al-Mayadeen, September 25, 2017). Tel Afar – Fifteen operatives of the “tribal enlistment,” a militia of tribesmen supporting the Iraqi government in its fight against ISIS, were killed in an explosion in a school in the city of Tel Afar, which was liberated from ISIS a month ago (al-Jazeera, September 17, 2017). Baiji – Four people were killed and seven wounded in by a suicide bomber who wore an explosive belt into a local restaurant (al-Sumaria, September 19, 2017). Kirkuk – Four Kurdish Peshmerga fighters were killed when an IED exploded on a road they were patrolling about three kilometers south of Kirkuk (al-Sumaria, September 23, 2017). Baghdad – The Iraqi security forces announced the exposure of a terrorist network that planned to carry out attacks on Shi’ite gatherings in Baghdad and southern Iraq (al-Sumaria, September 23, 2017). On September 23, 2017, the American forces, in collaboration with the Libyan government, carried out six attacks on an ISIS camp located southeast of Sirte. Seventeen ISIS operatives were killed and three vehicles were destroyed. The camp was used by ISIS to transfer operatives to and from Libya and to plan and carry out attacks. 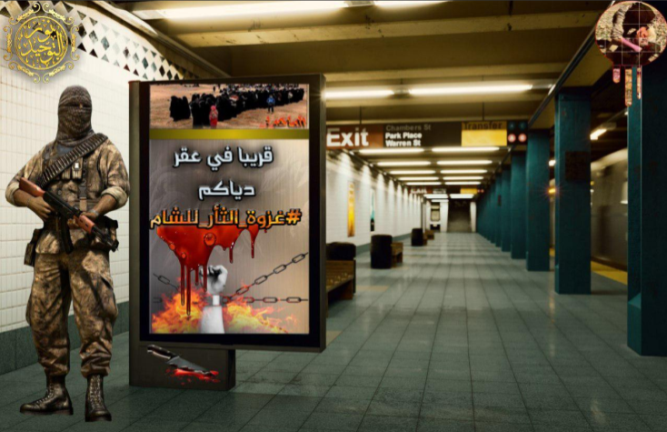 According to the American army, ISIS and al-Qaeda exploit Libya’s political instability to establish strongholds used to enlist fighters and transfer foreign fighters, direct attacks and recruit and transfer funds to finance terrorist attacks. Terrorist operatives in Libya exploit the area’s relative freedom of movement to carry out attacks in neighboring countries. In addition, there is a link between terrorist operatives in Libya and a number of direct terrorist attacks carried out in Europe (website of the United States Africa Command, September 24, 2017). ISIS is making efforts to reorganize its operatives in Libya. It has established a number of cells in recent months. It also set up new bases outside the cities and its operatives have begun acquiring funds by hijacking trucks and robbing refugee smugglers. According to Abu al-Baraa’ the Syrian, an ISIS operative who worked in al-Raqqa and defected to Turkey in June 2017, ISIS regards Libya as its front door into Europe. Senior European security authorities are worried by the efforts ISIS is making to reorganize its presence in Libya. They report that ISIS operatives went from Turkey to Sudan and from there to Libya. An intelligence officer in Sirte said that ISIS operatives who left Sirte are still present in dry river beds and have begun to set up control points to hijack trucks and merchandise. Others escaped to the village of Ghat in the southwestern part of the country, near the Algerian border, and they hold secret meetings and move freely around the area of the largest oil field in Libya. ISIS’s reorganization and its activity in Libya, after it lost its territorial base in Sirte about nine months ago (December 2016), may serve as a test case for its future activities in Syria and Iraq. In Libya, even after it was defeated and lost territory in Sirte, ISIS did not disappear, but rather changed its modus operandi. Currently ISIS operates in Libya as an ordinary terrorist-guerilla organization, without the Islamic State with territorial and civilian control over local residents. Its operatives are reorganizing, particularly in southern Libya, and working to acquire financial resources, including through criminal activities (hijacking trucks, robbing refugee smugglers). In addition to reorganizing, it is expanding its terrorist and guerilla activities in Libya and even initiating terrorist attacks in North Africa and Europe. On September 22, 2017, in the city of Merida, southwest of Madrid, a man was accused of making armed UAVs for ISIS. He was ‘Ata al-Haque, 34, director of a company in South Wales. He was linked to a network of front companies run from an office in Cardiff, Britain. The companies are accused of financing terrorist attacks in the United States and sending military-grade equipment for ISIS operatives around the world (The Times, September 24, 2017). An article written about ISIS’s current sources of funding quoted a report by Matthew Levitt, a researcher at the Washington Institute for Near East Policy. According to the report, most of ISIS’s funding today comes from criminal activities carried out in Syria and Iraq (including stealing flocks of animals; selling the passports of foreign fighters; collecting taxes from minorities, farmers and truck drivers; robbery; ransom for abducted civilians; the theft of antiquities; etc.) ISIS’s income from selling petroleum products is about $40 million annually. The money is mainly used to fund the organization’s institutions and pay salaries. According to British newspapers, ISIS, looking for new sources of funding, has begun trading in human organs. A doctor from Mosul told a writer from The Christian Science Monitor that ISIS had hired doctors and had a large network of organ dealers in the hospitals in Mosul. The organs are sold on the international black market at great profit. In addition, ISIS representatives are currently making the rounds of various countries, trying to collect contributions (al-Bawaba News, September 24, 2017). The al-Qaeda branch in Syria is a dominant element in the Fateh al-Sham Front. Forty percent of Syria's oil and natural gas are located around Deir al-Zor. For that reason the forces fighting in Syria are in competition for control of the area (al-Arabia al-Hadath, September 19, 2017).